Compare 2018 & New 2019 Furnace Pricing, Replacement and Installation Costs for Home Furnaces and Forced Air HVAC Heating Systems. Do you want to get an estimate for how much it’s going to cost to replace your home furnace or forced air heating system, and just can’t find thorough, trustworthy information online about how much a new furnace cost? Furnacepriceguides.com will answer your questions about the installation cost of new or replacement gas furnaces, oil furnaces, electric air handler furnaces and much more. Even better, is that we provide transparency by putting the replacement prices online, where everyone including other Professionals, can read and contribute. Within each section below you’ll find wholesale costs, installed cost, customer submitted pricing and actual installation costs listed at the bottom of each page. The user submitted information section contains the cost of a furnace only, installation cost, service or repairs, estimates or price quotes, and of course complete heating and air conditioning system replacement. Updated with the latest 2018 and new system 2019 prices and actual costs by homeowners, manufacturer price lists and website visitors. Gas Furnaces – The average cost of a new gas furnace system installed: $2,430 (does not include central ac) – Price lists for top rated brands. Secondary tables for other factors such as the cost for various size and efficiency, estimated cost of parts replacement, as well as the time it may take to complete the service, and more. Oil Furnaces –Average replacement cost for oil furnace system, installed: $5,390 – Pricing for many of the leading oil furnace brands in the market today. New models and manufacturers are added monthly as customers share the costs they are charged for repairs, replacement and much more. Electric Furnaces (Fan Coils and Air Handlers) – Average cost to have a new electric furnace installed: $2,180 – Price lists in this section include a table for the leading brands, commonly installed in homes throughout the USA. In addition, there is a section for repair and service costs, sizes and more. The price guides on our site are here to help our customers get a basic estimate of how much is a new furnace going to cost to remove, install, repair or replace the existing system that heats your home. The guides contain the approximate wholesale cost of parts and equipment that contractors pay, as well as the estimated installation prices for leading system brands like Carrier, Goodman, Trane, Bryant, Lennox and many others. In addition to change outs, we have detailed sections on each page about furnace repair costs with labor estimates and parts replacement on the most common services and repairs. The average cost of a new furnace, not including central air, is $1,950 to $5800. I understand how useless that wide range is, to many people looking for an average cost. However, the price you pay will vary widely, depending on the type of heating system, (gas, oil or electric) the size of your home, energy efficiency, and the difficulty of the installation in your home. Now is the time for you to research costs associated with the different types, efficiency, (afue) and other variables by choosing the fuel for your home furnace below. We field a lot of questions from homeowners who are looking for answers to the furnace replacement options. Coming from a background of both sales, operations, and installation of HVAC systems, we’ll try to answer them as best as we can. Please understand that in most cases, the best answer is to speak to a local professional, who can view your system, your home and weigh other factors into the response that we just can’t cover here. Q: How much does a new furnace cost? A: Similar to several other furnace replacement questions, it’s just not a simple one to answer. Many factors have to be considered before you can estimate the replacement cost of a furnace in your home. Please use our price guides for gas, oil and electric furnaces to get an estimate of the cost, before you call a pro for a more certain price quote. Q: Can I buy my own furnace and install it myself? A: In some areas, yes you can buy a furnace and replace it yourself. In others however, you may be required to get a permit and inspection, so that it’s assured the gas lines and electric connections have been properly connected. Most areas that require an inspection, may require that a licensed professional request the inspection. We recommend that before you ever try to install your own furnace, you speak to a local professional or call your town offices to see if local regulations allow it. Q: How much does it cost to replace a furnace? A: While our website focuses on providing furnace price estimates, the only true way to know how much it will cost to replace yours, is by getting free estimates from local professionals. Each home and situation is different and it’s too hard to provide an accurate furnace replacement cost without weighing in all factors. Q: How often should you replace your furnace? A: A properly installed and well maintained furnace should last 15-20 years. Q: When is the best time to replace your furnace? A: There are two answers to this question. The best time of year to replace your furnace is when local companies are slow. Knowing your own climate should tell you when heating and/or cooling are not being used in your home. For instance, in early spring, and again in the early fall seasons. Since companies are not busy, they’ll likely give you a cost break to keep their crews busy. The other time that its best to replace your furnace is when your repair bills are continually piling up. If you find yourself spending more than 25% of the cost of a new furnace on repair work, and your furnace is more than 10 years old, it’s likely time to replace it. Q: How many furnace price quotes should I get? A: Like any major home improvement, and furnace replacement is definitely a major project. 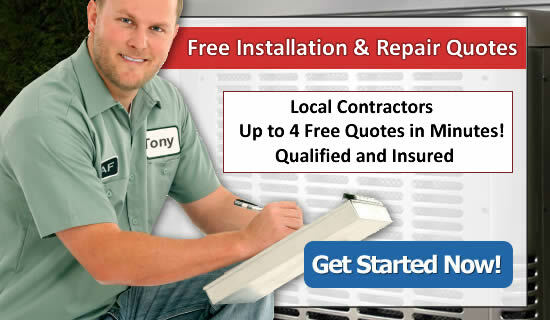 You should always get 2-4 furnace installation quotes from local companies. This will not only allow you to compare what is included, but also get a better feel for the company you’re going to allow into your home. Q: Why are the costs here listed higher than Lowes furnace prices? A: Lowes sells furnaces for installation at your home and if you are handy or have help from a professional, you can buy it and install it yourself. While you may be tempted to try this yourself to save money, the safety of your family and home should be your utmost priority. You should also note that no leading furnace brands allow their products sold at Lowes without going through a contractor. Simply put, installing a furnace is not as simple as removing the old and putting the new furnace in its place. We encourage you to talk to a contractor before you decide to purchase a furnace on your own. Lowes also provides Professional Help (paid) from their own contractors to help homeowners, who decide to take that path. 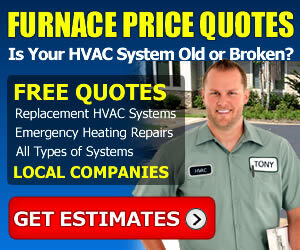 Q: Is there a furnace price calculator on your website to get replacement estimates? A: We don’t have a price calculator on this site at this time, but it is being installed soon. For now, we suggest you go to the correct page for your type of furnace, and find the most appropriate sized unit based on home size, or size of your existing furnace. A: There are several ways to determine what type of furnace heats your home. The easiest is to start by the process of elimination. If you don’t pay for natural gas, propane, or home heating oil, you can safely eliminate one or the other, or both. Aside from calling a professional to look at your system and tell you, you can look at the brand and model on your heating system and look it up on the manufacturer website. Electric furnaces are commonly found in southern states that use heat only a few months out of the year due to being very inefficient. Q: Does the outside AC need to be replaced at same time as furnace? A: The simple answer is: Maybe. Even if the outside central ac is not working, it does not have to be replaced to provide heat to your home. If you have a heat pump though, it may have to be replaced, as the coils inside most electric furnaces are matched to the outside unit as well. For gas, oil, and electric furnace with straight central air, the furnace can work independently of the ac system. Note: Although it does not have to be replaced, in most cases where your system is more than 10 years, it should be replaced at the same time. It will save you considerably on your installation costs, since the furnace needs to be separated from the coil and duct regardless. In many cases, heating and air contractors will replace the outside unit at just over costs, just to get the job, and to do the customer right. Q: Can the cost of new furnace be added to my utility bill? A: This is a very good question and in our experience, and with your good credit, many major natural gas and electric utility companies around the USA will allow you to purchase and have installed a new furnace, and spread the payments out through your monthly billing. Check with your local utility company, you may be pleasantly surprised.